The Global Volcanism Program has no activity reports for Mat Ala. The Global Volcanism Program has no Weekly Reports available for Mat Ala. The Global Volcanism Program has no Bulletin Reports available for Mat Ala. The Global Volcanism Program has no synonyms or subfeatures listed for Mat Ala.
Mat Ala is a low shield volcano in the southern Tat Ali Range, east of Afderà volcano. A 300-m-deep, 2.5 x 3.5 km wide caldera is found at the summit of the volcano, whose flanks are cut by numerous N-S-trending faults. Mat Ala has been active during the Holocene, and fumarolic activity occurs along a fissure SW of the volcano. The Global Volcanism Program is not aware of any Holocene eruptions from Mat Ala. If this volcano has had large eruptions (VEI >= 4) prior to 10,000 years ago, information might be found on the Mat Ala page in the LaMEVE (Large Magnitude Explosive Volcanic Eruptions) database, a part of the Volcano Global Risk Identification and Analysis Project (VOGRIPA). There is no Deformation History data available for Mat Ala. There is no Emissions History data available for Mat Ala. 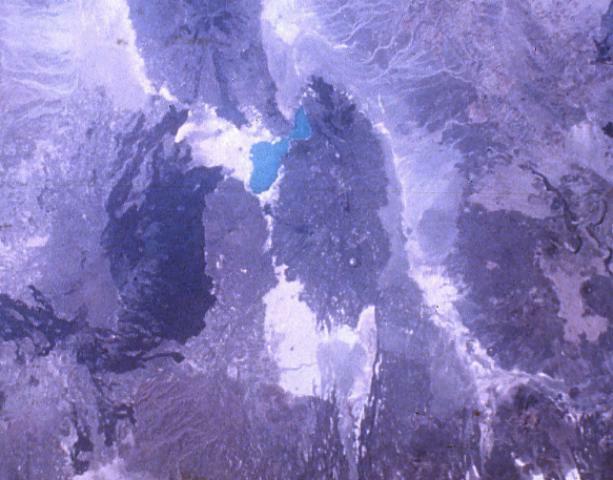 The elongated N-S-trending volcanic chain below and to the right of turquoise-colored Lake Afrera consists of the Tat Ali complex at the northern end and the Mat Ala shield volcano at the southern end. Mat Ala contains a small 2.5 x 3.5 km wide caldera visible as a small light-colored dot near the southern end of the chain in this NASA Space Shuttle image. To the SW of Lake Afrera is medium-toned Afderà volcano; Alayta volcano with its extensive dark-colored lava flows is farther to the west. NASA Space Shuttle image S-19-35, 1984. There are no samples for Mat Ala in the Smithsonian's NMNH Department of Mineral Sciences Rock and Ore collection. Large Eruptions of Mat Ala Information about large Quaternary eruptions (VEI >= 4) is cataloged in the Large Magnitude Explosive Volcanic Eruptions (LaMEVE) database of the Volcano Global Risk Identification and Analysis Project (VOGRIPA).